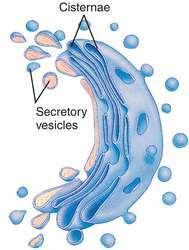 Acrosome formation begins in spermatocytes with the formation of small proacrosomal vesicles, and the presence of well-developed Golgi bodies suggests that these play a role in their formation. 1985a), observed vesicles budding from Golgi bodies in the F-cells of fed green tiger prawn Penaeus semisulcatus and suggested that these vesicles were enzyme precursors or zymogens, but this is yet to be confirmed or observed in other penaeids (Dall 1992, Icely & Nott 1992). The perinuclear cytoplasm contains 1-3 Golgi bodies, residual bodies, granules of medium electron density, rare mitochondria, and cisternae of rough endoplasmic reticulum (RER). Both columnar cells and gland cells have a fine granular cytoplasm replete with Golgi bodies and electron-dense and electron-lucent vesicles of varying sizes (Fig.